The Doctor is activated on a strange world 700 years in Voyager's future. What he learns disturbs him: his crewmates are the villains in this world's seminal war story. And use lots of hair gel, which is always a bad sign. Matthew: I was just today telling my oldest son what an allegory is - a story that uses a foreign or fantastical setting to examine an issue that affects the audience. Now, we were talking about "The Butter Battle Book," but this episode is an allegory par excellence. Here the subjects are history, race relations, and the value of truth. The Kyrians lost a war 700 years prior to this episode, and have been selectively remembering their heroism ever since. When the Doctor (a backup, we'll get there) shows up in their historical museum, he throws a wrench in their collective narrative of events. The viewer can just imagine the sorts of revisionist history we could see in our own world - if the crucifixion were revisited, the debate over the US Constitution, any number of consequential battles or births, and so on. What details would change, and how receptive would people be to them? This episode goes the extra mile and asks the ethical question: if a factually incorrect narrative has social value, or correcting the narrative would lead to suffering, does the truth matter? Then, to top it all off, we have the racial elements. The scene in which the Vaskan museum patron questions this version of events, averring that "he has Kyrian friends" but doesn't want this version of history taught to his children was just superb. All in all, my brain was thoroughly engaged with this story as it is in the very best Star Trek. Kevin: This is definitely one of my favorite episodes of the series. I think the episode succeeds because it does such a good job making everyone's point of view credible if not exactly sympathetic. I completely buy the subjective position of every actor and that sells the complexity of the issue. I also like the world building they managed to do quickly. We got a good view of this world both now and in the future. As far as allegories go in Star Trek, this is definitely one of the lightest touches, and I think that also contributes to the show's success. Other outings, like Let That Be Your Last Battlefield, really pile on the message. This pretty much lets the audience arrive at that conclusion on its own. I think the only possible weak point is that the Tedran is pretty one-dimensional as a bad guy. Matthew: Beyond the allegorical elements, we have a quasi "mirror universe" type show here, too. We are given an alternate version of Voyager, ship bristling with weapons, peopled by crew members from conquered races, full of malign torturers and knaves. It makes for a lot of fun scenes, especially the ones revolving around the captain's cold-bloodedness. It does raise questions of how and why the Kyrians even have notions of the names and histories of the Voyager crew, but whatever. It added spice to the narrative, as "mirror" type portrayals often do. What made this one work even better was that it had a sense of internal logic to it - the Kyrian narrative made sense, even if it was a little bit too obviously villainous. Kevin: The original "Mirror Mirror" I think will always have the lock on best Mirror version, since the acting back then was bigger, so bigger and evil felt less jarring, but I agree that the versions we get here are fun. I liked the little touches they got close to right, like the degree to which Seven remain borgified. We as long-time viewers obviously knew it was wrong, but as a piece of storytelling in itself, it never crossed the line into an internally absurd story. Matthew: The emotional stories here work well. Look. The Doctor is a "backup." Let us acknowledge that this setup device is clumsy in the extreme and that obvious practical and ethical questions go unexamined (a sentient backup relegated to standby oblivion?). But I believed the Doctor's emotions, his indignation at being misrepresented, his desire to rejoin (?) his crew mates, his desire to do no harm with the truth. On the other end, the Kyrian scholar Quarren also has an emotional journey to make when his hallowed version of events comes under question. I totally bought his initial resistance and then his capitulation to the truth. The scene where he talks about how his love of history was sparked by hearing Voyager stories as a kid was great, too. Kevin: I completely agree on the issues raised by the idea of backing up the Doctor casually. It's almost as annoying as if they created a random back up copy of Data and name him B4, but that would never happen. The Doctor manages to really be a great emotional core for the episode. His anger and ultimate desire to help are really relateable and provide the audience with the necessary in for this world. Matthew: Robert Picardo does excellent work here as a man out of time, trying to correct misperceptions of him and his crew. He has a few good laugh lines but also some nice emotional scenes. His acting choices really made the episode's dilemma (truth vs. social stability) feel real. He also had a nice turn as the Data-esque "Evil" version, too. It was better work than his previous "Evil Doctor" roles. Kevin: This was really a bravura performance. Whether or not I care about this story hinges a lot about how well he can sell it. I brought his arc of both his outrage and his concern for the consequences of his pushing for the truth to come out. Matthew: "Alien of the week" episodes live or die by their aliens. Luckily, they really nailed casting here (with good dialogue in the writing, of course). Henry Woronicz as Quarren was excellent. He also played Gegen in "Distant Origins," and it's clear why they brought him back - he can portray a scholar with high-minded ideals and ethical conflicts to a tee. His verbal jousting with Morgan Margolis as the skeptical Vaskan museum patron was great, and Margolis really nailed the "privileged sneer" attitude. I thought the actors portraying the board of magistrates were also quite good at portraying the tug and pull of social forces and race identity in their society. If I had to compare this to another episode that got all the aliens so right, it would be TNG's "First Contact." Kevin: The actors managed to give depth and variety to the aliens, the hallmark of any alien society. Your mention of First Contact is really interesting as I recall my specific compliment for those aliens was that, given that several were stage veterans, did a good job of acting like their character was the main character without wrecking the scene, and I think the compliment applies here as well. Everyone of the aliens of the week acted like they were the protagonist and it really helped sell the interal life of the world. Matthew: Everyone (except the pregnant Roxann Biggs) gets a chance to do an "evil" version of their character, but I'd say Kate Mulgrew does the best job with it. Of course it's fun to twirl your mustache and vamp all over the stage (cough, Intendant Kira, cough cough), but Mulgrew does a lot to make her character feel like a real person with actual motivations, even if we disagree with them. 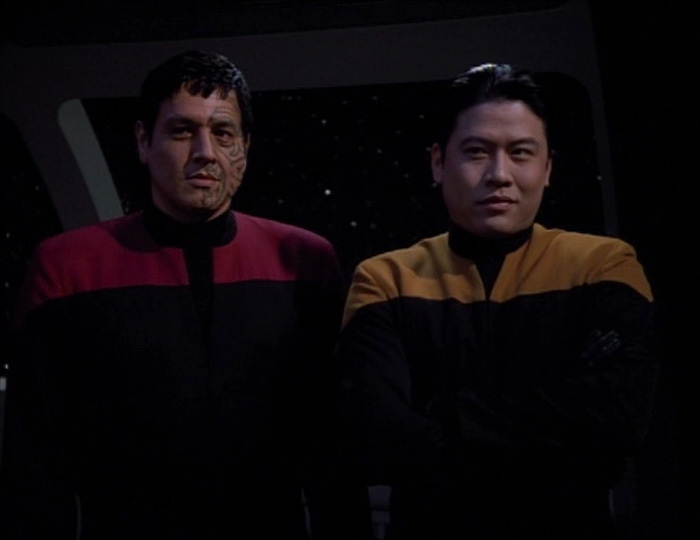 Kevin: I will always have a soft spot for the Mirror Universe's Intendant, but must concede that Janeway's version of Evil Twin is probably more coherent from a narrative standpoint. The performances while over the top still stayed just inside the line to not make the historical reconstruction completely ridiculous. Beyond that, it was fun as ever to see our beloved characters act out of character. Matthew: The museum set was quite nice. Architecturally, it looked like a unique and interesting space, with its curving lines. The props were artfully arranged as well to look "curated." On the exterior, the matte paintings were just ok. They had interesting design elements, but the digital creation process just doesn't seem up to snuff yet at this early stage. On the other hand, the "warlike" Voyager alterations that were done digitally looked really nice. Kevin: I liked the museum set, too. The cuts into the Voyager set worked, and I couldn't help but be reminded of The Mark of Gideon when looking at the windows full of people. The riot scene was also well done, giving the scene a feeling of a lot of people with a finite number of extras. Matthew: The alien makeup was pretty good. I wasn't a big fan of the Kyrian nose appliance, but the Vaskans had character and variety, which made them feel like a real people. Costumes were on point, too. Kevin: The Vaskans had a neat almost lupine/leonine look that made them look like real creatures. The Kyrians were fairly standard in the nose appliance department, unfortunately. I do question how two such different species could evolve on the same world, but that's a small complaint. Matthew: When you're above average in writing, acting, and production values all around, we're definitely going to consider this an upper tier episode. But how upper? This is a 5 in my book because it has ambition and delivers on it. When I am made to think about historiography by a television show, I am impressed by the effort and honored by the respect it shows the audience. That this was a Bryan Fuller joint gives me hope for the new series - this is a quintessential Star Trek story. Kevin: I agree with the 5, for a a total of 10. This is one of those episodes that really reaches for something, and I think it succeeds fully. There's a nuanced examination of a complex issue in a way that invites the audience to think about it rather than simply lecturing them on it. The combination of a light hand in the script and the top notch acting by the Doctor and Quarren really make a high score a foregone conclusion. Was indeed a great episode. The evolution of the doctor continues to impress. In the podcast Matt brings it up at 37:50, you guys discussed whether or not it would be possible to turn someone from the hero to a villain (or vice versa), even over the timeframe of 700 years. The idea that immediately occurred to me was Ender the Xenocide, as he's referred to in the books following Ender's Game. That was the result of a story that was told within that world which no one could know was actually non-fictional, and that evolution of Ender from revered hero to reviled monster felt very natural within the context of the story. I don't find it unthinkable at all that a similar thing could happen here with the characters involved with a story being told through somewhat unreliable narrators, especially when political agendas come into play. Oh and I was very glad that it ended with Picard's line from The First Duty, because every time you guys said the word "historical truth" throughout the episode, I thought of that line and said it in my head.